Tiki Shack Importer features natural and non-toxic building materials that are safe, environmentally friendly and sustainable and are reusable. We are the industries leader in tropical building materials. Hawaii, Canada, PR, VI. shipping charges apply. Each roll measures 4'high x 8'wide x 1/8 thick. Slats are 11/16 wide. Has paper backing just like wallpaper. 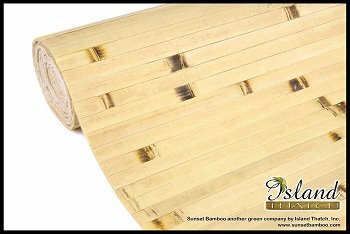 These bamboo wall coverings are an excellent alternative to wall paper or paint if you want to refresh the look of a room. Quickly installs temporarily or permanently over any existing wall or ceiling, just unroll and nail or glue to your wall. For ceiling applications, or a more permanent wall installation, construction adhesive should be used in addtion to nails. Because of it�s flexible construction, it is easy to install continuously around corners. Trimming to the proper length needed is a snap, just cut through the fabric backing between slats. Prepare the walls If you're hanging wallpaper on new drywall, prime the wall first with wallpaper primer to seal the drywall and help the paper adhere to the wall. Wash any dirt or dust from the old walls and sand smooth any chipped paint. Remove old wallpaper using wallpaper remover, a wide blade, and rags. Remove electrical outlet and light switch covers. Use a putty knife to apply spackle over holes or cracks. Allow the spackle to dry, then sand lightly until the surface is smooth. Pick a starting point. The first strip of wallpaper will line up with the last strip of wallpaper you hang and the pattern should match up at that place. You will want to start and finish wallpapering in a corner, near the curtains or behind a door so that the mismatch is less obvious. The focal point of the room should have the fewest seams. Measure out from your starting point and use a level to lightly draw a vertical straight edge on the wall. This line marks where the first strip of wallpaper should be placed. Cut the bamboo wall cover Lay the first roll of bamboo wallpaper, print side down, on the flat work surface. Confirm the top and bottom of the pattern. Measure, then cut the first wallpaper strip to the proper length, adding a few extra inches at the top and bottom. (This will be trimmed off later). Measure and cut the next several strips in order, paying attention to pattern match. Cutting vertically is easy just cut the cotton mesh along the line whenever possible, don't forget you have the corner space to hide with the molding. Cutting them horizontally or cross cutting require miter chop saw with a shape plywood blade, put the rolled up bamboo cover on the saw and let the saw run till full speed before slowly lower the blade to cut the bamboo wallpaper. Apply wallpaper paste. For un-pasted wallpaper, apply pre-mixed paste using a large pasting brush or paint roller, working from the middle to the ends. Be sure that all areas are covered with paste with no un-pasted spots. Gently fold the top of the sheet down to the middle so that the pasted sides touch. Next, fold the bottom edge up to the middle. This allows the paste to cure and keep it from drying out. Do not crease the wallpaper. Hang the bamboo wall cover Starting at the ceiling, carefully unfold the top half of first piece of the wallpaper and gently place the side edge of the strip along the measured line. Don�t forget to leave a few extra inches of paper at the top and bottom for trimming later. When the strip is in the right position, drop down the bottom half and gently smooth the paper against the wall with your hands, beginning at one edge and working your way across. Use a smoothing brush or damp sponge to smooth out any air bubbles. Use a seam roller to gently smooth down the edges of the wallpaper. Trim the excess bamboo wall cover. Use a wide-blade putty knife to hold down the top of the bamboo wallpaper strip at the ceiling. Use the utility knife or straight-edge razor to trim the excess wallpaper. Repeat at the bottom of the strip. Carefully clean any paste from the ceiling and baseboard. Wipe the strip of wallpaper with a clean, damp sponge to remove any paste and remaining air bubbles. Smooth the corners. 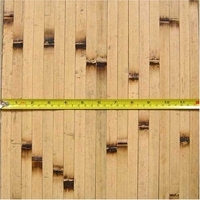 At the corners, measure from the last full-width strip of bamboo wallpaper to the corner. Add 1 inch to that measurement and cut the next strip of wallpaper to that width. Activate or apply paste to the strip. Apply the wallpaper on the wall, making sure to smooth it totally into the corner for interior corners or around the corner for exterior corners. At the corner, make a small slit from the top of the strip to the wall to allow the strip to lay flat at the ceiling. Repeat on the bottom to allow the strip to lay flat at the floor. Trim off the top and bottom and clean the strip. Repeat hanging the strips around the room. Continue hanging the next strips of bamboo wallpaper, taking care to match the pattern, trimming at the ceiling and floor, removing any creases or air bubbles, securing the seams, and cleaning the paste off the paper. Copyright 2018 Tiki Shack Importer. Serving all 50 states Alabama, Alaska, Arizona, Arkansas, California, Colorado, Connecticut, Delaware, Florida, Georgia, Hawaii, Idaho, Illinois, Indiana, Iowa, Kansas, Kentucky, Louisiana, Maine, Maryland, Massachusetts, Michigan, Minnesota, Mississippi, Missouri, Montana, Nebraska, Nevada, New Hampshire, New Jersey, New Mexico, New York, North Carolina, North Dakota, Ohio, Oklahoma, Oregon, Pennsylvania, Rhode Island, South Carolina, South Dakota, Tennessee, Texas, Utah, Vermont, Virginia, Washington, West Virginia, Wisconsin, Wyoming, Riverside, San Bernardino, Inland Empire, San Diego, Orange County, Southern California, Northern California, Corona, Los Angeles, Las Vegas, Virgin Islands.